The Digital Research Library of Illinois History Journal™: The 1893 Chicago World's Columbian Exposition Observation (Ferris) Wheel. 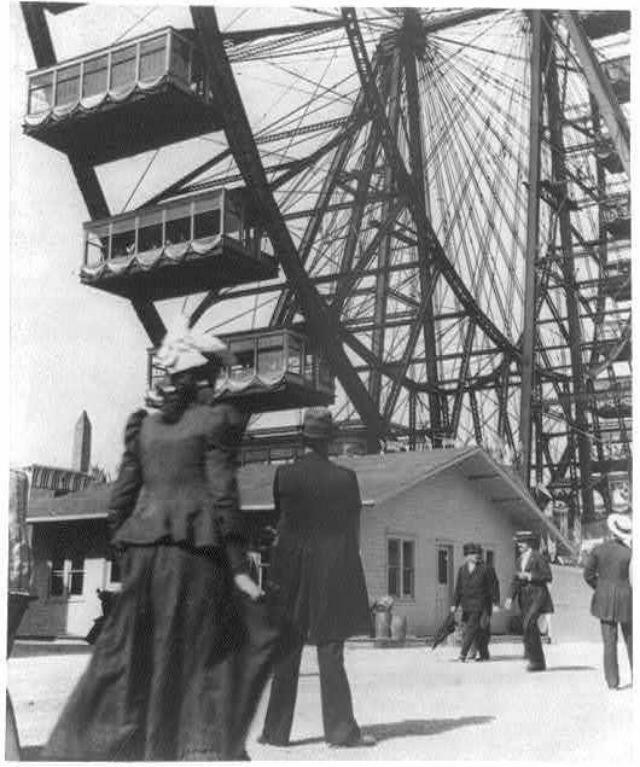 The 1893 Chicago World's Columbian Exposition Observation (Ferris) Wheel. 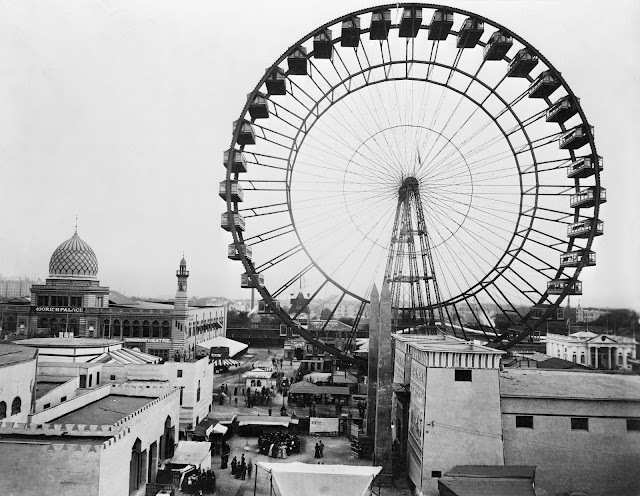 The original Ferris Wheel, sometimes referred to as the Observation Wheel or the Chicago Wheel, was designed and constructed by George Washington Gale Ferris Jr. and was the centerpiece of the 1893 World's Columbian Exposition in Chicago, Illinois. For its inaugural run, no cars had yet been attached. The workmen however, climbed the structure and settled themselves on the spokes to the accompaniment of cheers from an audience of fair employees who had gathered to watch the momentous event. 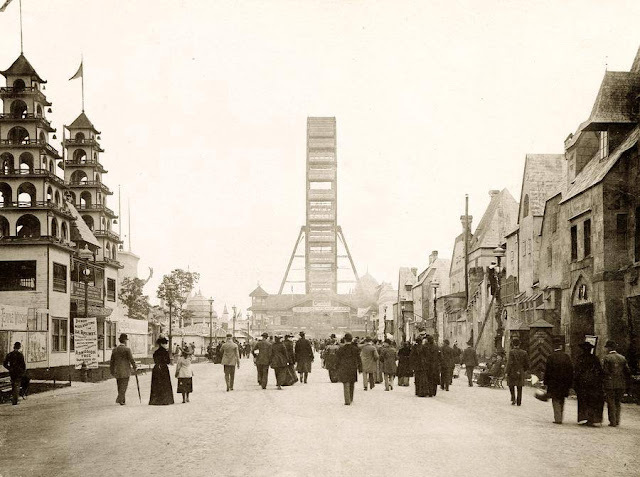 After the wheel had completed its first rotation, Gronau deemed the test a success. "I could have yelled out loud for joy." 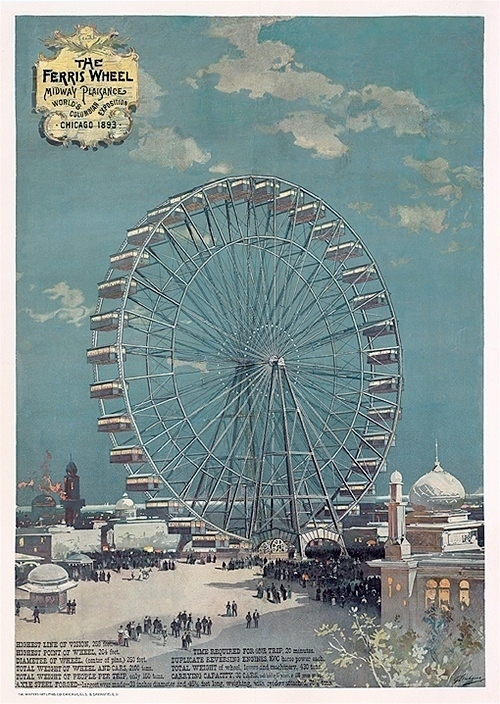 Ferris himself had not been able to attend the launching of his invention, and that evening received a telegram: "The last coupling and final adjustment was made and steam turned on at six o’clock this evening one complete revolution of the big wheel was made everything working satisfactory twenty minutes time was taken for the revolution ─ I congratulate you upon its complete success midway is wildly enthusiastic." 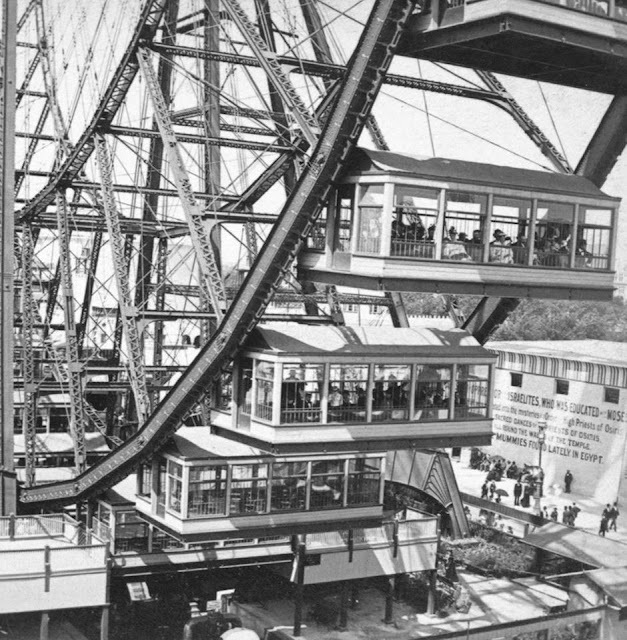 The description of the Ferris Wheel's statistics begins with the two 250 feet Wheels with 36 enclosed passenger cars hanging between them. The size of streetcars ─ 27 foot long, 13 foot wide and 9 foot high ─ with large observation windows barred by iron safety gratings, each car was fitted with 40 swivel chairs and had room for twenty more standing passengers for a total of 60 passengers. The Wheel rotated on a 142,351 pound (71 tons), 45½ foot axle comprising what was, at that time, the world's largest 'hollow forged' axle weighing 89,320 pounds, together with two 16-foot-diameter cast-iron spiders, for the spokes, weighing in at 53,031 pounds. Each car weighed 26,000 pounds (13 tons). 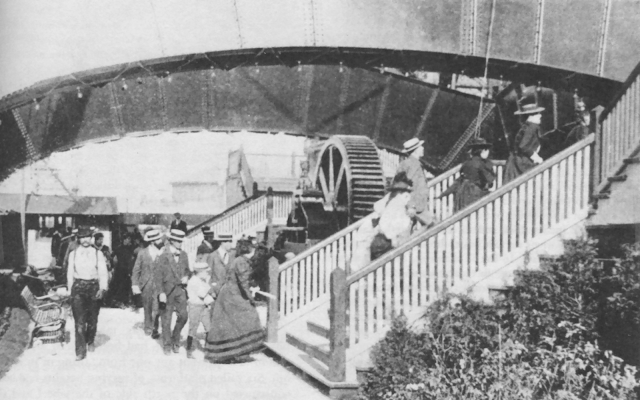 Stepped platforms at the base of the Wheel enabled six cars to be loaded and unloaded at a time. Fully loaded, the Wheel's maximum capacity was an astounding 2,160 passengers. Each car carried a World's Fair employee to keep an eye on the passenger’s health and well-being. 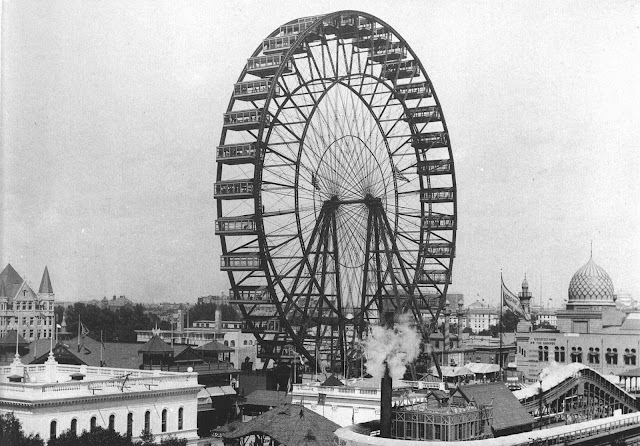 The Ferris Wheel took 20 minutes to make two revolutions (your ride), the first involving six stops to allow passengers to exit and enter and the second a nine-minute non-stop rotation, for which the ticket holder paid 50¢... the same cost as the entrance fee to the World's Fair. Steps to the platform to enter and exit the Ferris wheel, six cars at a time. 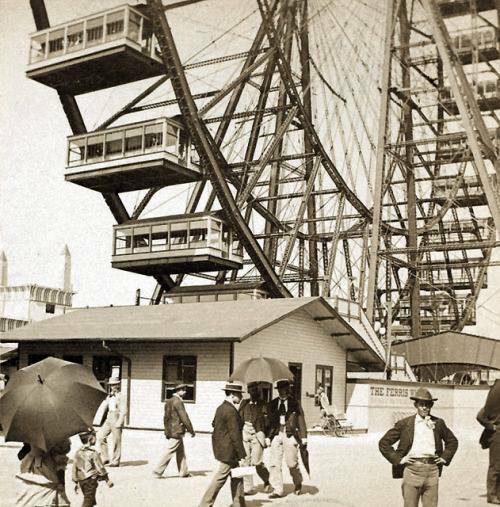 Note the American Banners draped under the Ferris wheel cars windows. It was instantly hailed as the "Eighth Wonder of the World." In 1893, skyscrapers were in their infancy. 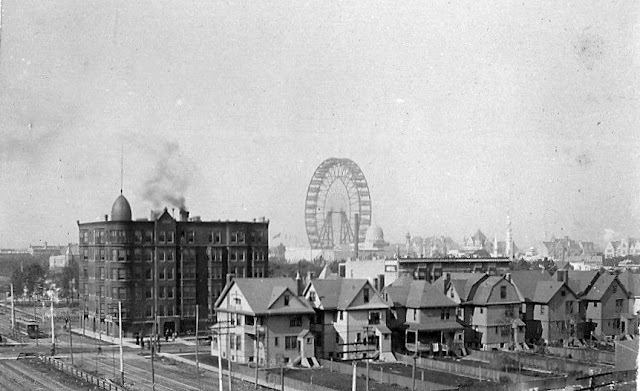 The 264 foot high Ferris Wheel stood just a bit shorter than the tallest building in North America at that time, Chicago's Masonic Temple completed in 1892 which was 302 foot high (demolished in 1939). 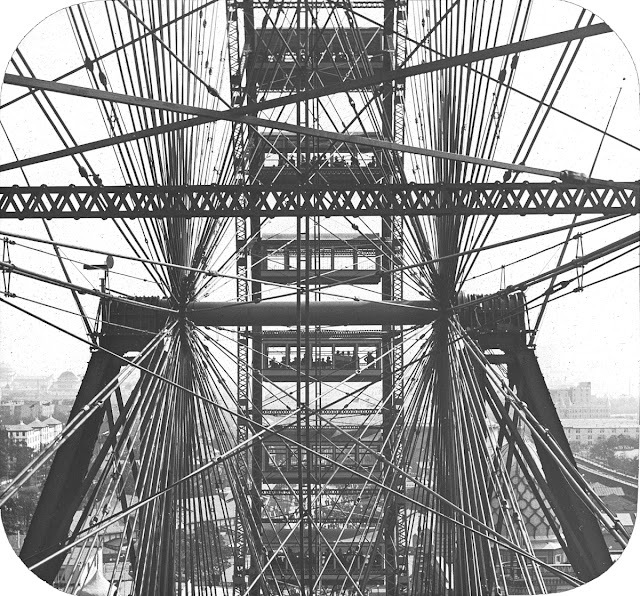 The Wheel was outlined at night by 1,400 light bulbs and reportedly could be seen from 50 miles away. 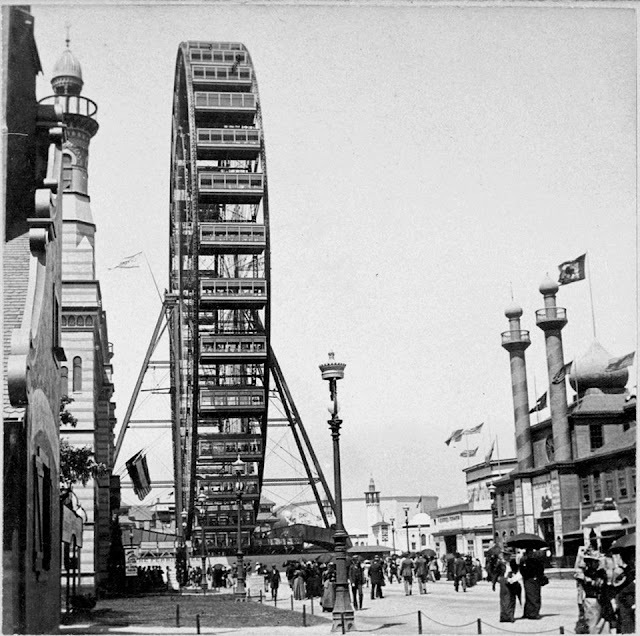 The wheel itself closed in April 1894 and was then dismantled and stored until the following year when it was rebuilt for the opening of Ferris Wheel Park in 1896. 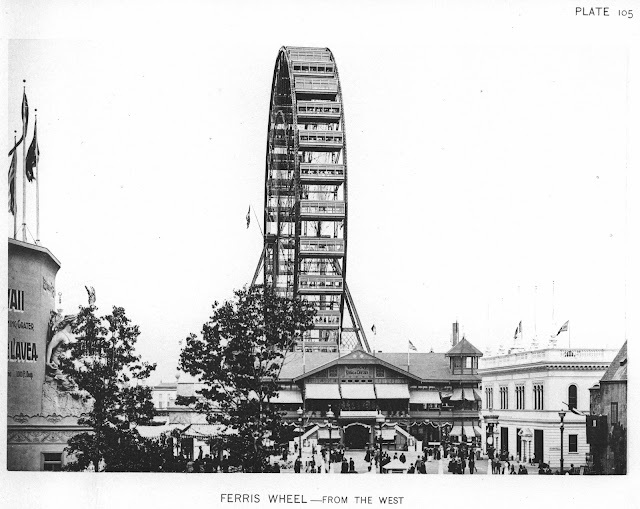 Ferris Wheel Park was located in Chicago's Park West neighborhood of the Lincoln Park community at 1288 North Clark Street (today: 2600 block of North Clark Street). The Ferris Wheel at Ferris Wheel Park. 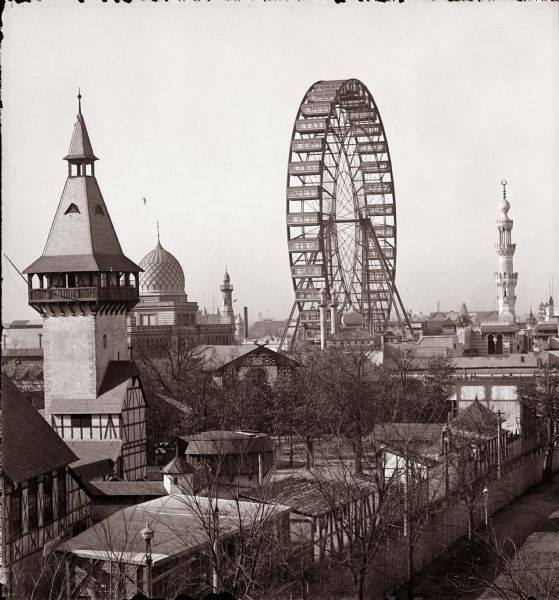 Next it was dismantled and rebuilt for a third and final time for the 1904 Louisiana Purchase Exposition World's Fair in St. Louis, Missouri. It was demolished there in 1906 and rumored to have been blown-up and buried in Forest Park in the City of St. Louis. 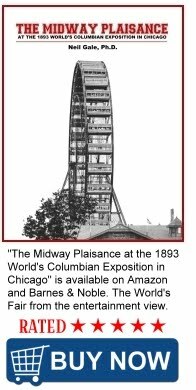 For an in-depth history of the 1893 World's Columbian Exposition's Midway Plaisance (the birth of the amusement park) where the Ferris wheel was the main attraction, check out my book "The Midway Plaisance at the 1893 World's Columbian Exposition in Chicago." All designed by engineers with pencils, paper, and slide rules. Pretty much the same as we had in the 1960's. It makes some of the "achievements' of current times look a little less heroic. A wonderful article. Thank you Neil.